Protective devices such as relays, overload Coils, Circuit breakers and CTs etc. must be checked regularly to ensure that they are always ready to operate correctly, Routine current injection testing will quickly detect faulty or incorrectly adjusted protection circuits / devices & will be possible to prevent serious damage to the system. 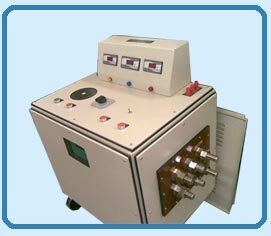 Primary injection kit is designed to operate on single phase 230/240 volts AC 50 HZ to develop smooth & continuous test current as for loading, calibrating, and testing of CTs, Bimetal Relays, Protection Relays etc. The test set gives high current output at low cost and with inherent safety .The primary current injection testing checks all parts of the protection system by injecting current down the cable / bus bars. The application of the primary current injection sets is to ascertain the current carrying capacity of any Conductor, insulator, connector or calibration of CTs / bi-metallic relays etc. 5A/1A associated with multiratio current transformer with suitable ranges. Aux. Contacts for Timer connection. Terminals for connecting relay under test. High current output on suitable terminals.